"Arita ware" is the general term for the porcelain and ceramic made in the Arita region of Saga prefecture, Japan. Most of Arita ware is porcelain, and its thin, light, smooth glass attracts many lovers and aficionados of porcelain. Arita ware has high durability and has no absorbency, presenting a high-quality feeling. Porcelain is tougher and stronger than regular ceramic, so this Arita ware can confidently be used daily. Arita ware is made from high-grade "Amakusa" clay and is fired in a kiln at 1300° C high temperature, which makes it much harder - like an original mineral; its strength is kept even if it is made thin as to allow light to pass through. Its skin is very smooth because the porcelain is made with mixed clay of the powder of the pottery stone - whereas ceramic is made with clay only. After years of study, Sanyo Sangyo designed the ideal internal flower pedal ribs inside the dripper. Thanks to these ribs, speed of brewing is equal to that of hot water supply from the top so that you can enjoy your aromatic coffee without unpleasant taste. Flower dripper keeps deep filter layers by making hot water flow from the center to the outside in order to bring out the flavors of the coffee. 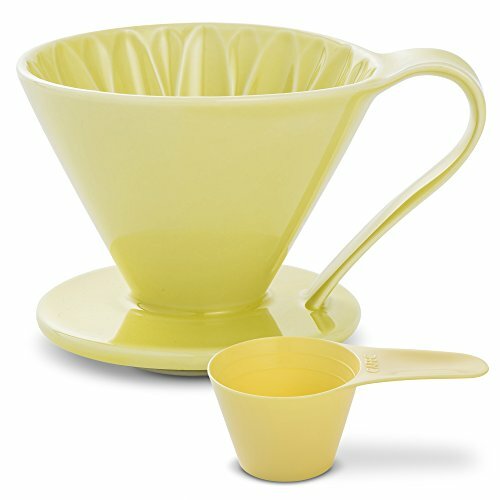 Cone-shape: Cone shaped dripper helps you to brew smooth and tasty coffee by getting the water through all the grounds. Coffee dripper with flower-shaped ribs inside. Its elegant shape and touch provide a feeling of high-quality. 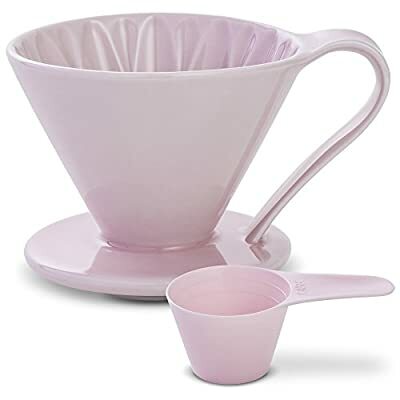 As the world's first inventor of cone-shaped filter paper, after many years of research, Sanyo Sangyo has designed the flower dripper which can enrich the taste of the coffee. This flower dripper is made by Arita Porcelain. Strictly inspected by craftsmen with the highest quality standards. Integrated handle: Easy to grip and comfortable in your hand.